It is Secret Recipe Club time and this month I was assigned Mom's Test Kitchen. Mom's Test Kitchen is written by Jamie. Jamie started her blog after a couple of years of being home with her daughter. I also started blogging after 4 years of taking care of my kids and wanted to do something that was not child-related. 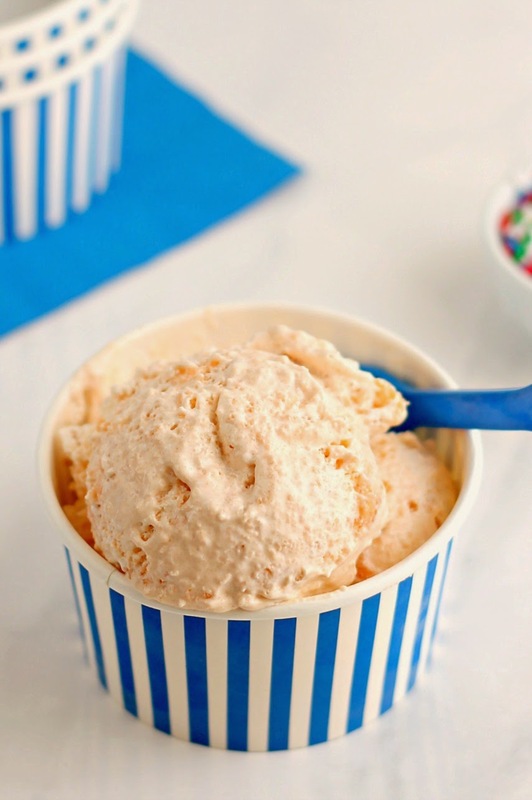 I chose to make Jamie's Skinny Creamsicle Cake Batter No Churn Ice Cream. It seemed similar to my Mango Ice Cream. Both recipes use Cool Whip and condensed milk. This recipe is not something I would normally make. I tend not to use cake mixes although I do love how tasty they come out. I also rarely drink pop. I happened to have a can of Orange Crush in the fridge. So I thought I would give this recipe a try. I liked that it was no churn and was quick to make. Jamie's recipe uses Sunkist TEN soda. We do not get that in Canada so I used Orange Crush. After making the cupcakes which will later get mixed into the ice cream, I realized I should have compared the size of the cake mix to what is stated in the recipe. Sizes don't always match up between Canada and America. For example, in America canned beans come in 14 oz tins where as up here they are 19 oz. The cupcakes on their own were a hit with the boys. I thought they were tasty but found them to be very fragile and they fell apart easily. It may have been due to some size differences between what I used and the recipe. The ice cream tastes best the next day and the orange colour comes through nicely after sitting in the freezer. Overall, we really enjoyed this dessert. It isn't the consistency of traditional ice cream. It is much thicker and the texture is different hence why I call it "Ice Cream". Orange Crush Cake Batter No Churn "Ice Cream"
Line a muffin tin with paper liners. Instead of this, I had sprayed the muffin tin with baking spray but because the cupcakes are so fragile, it was very difficult to take them out. In a large bowl, add the cake mix. Pour in the Orange Crush and mix well. Pour into the prepared muffin tin and bake according to the cake mix directions. Allow to cool completely. In a large bowl, whisk together the Cool Whip and condensed milk. Crumble in 6 of the cupcakes and fold in. I had added 7 cupcakes but keep in mind that the more cupcakes you add, the thicker the ice cream will be. Transfer to a freezer safe container. Put in the freezer. This ice cream tastes best the next day. What a nice recipe, I can imagine how fresh it tastes! great pick for your assignment this month! Hope you are having a nice time browsing the collection of goodies! Cake and Ice cream rolled into one...How innovative is that!! So none of those things ever live in my house but you have no idea how much I want a cup of this right now! Great pick! You had me at "no churn". This recipe looks too good not to try. Pinning and trying it ASAP! I love my ice cream maker but sometimes it's nice to not need to plan ahead and be able to make no churn ice cream. Great recipe for the summer! How intriguing is THAT recipe! Love all those flavors. Great SRC pick! What a cool idea! I would never have thrown all those together for ice cream, but it looks soooo good! Really great pick this month!! Such an interesting mix of ingredients! When you mentioned that it had cake mix in it, I didn't realize that you have to bake the cupcakes first... Looks good! I like no churn ice creams since I don't have an ice cream maker . It sounds like an interesting recipe to try. Nice pick Asiya, this looks divine and a must try. I do not have an ice cream maker so this is a good recipe for me.